VeriShield Protect: Highly secure: PCI PED 2, Optional PCI PTS 3.0. 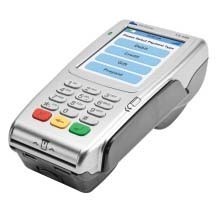 The Verifone Vx670 offers the latest in wireless credit card processing terminals from Verifone. It is the worlds smallest full function handle held payment device. It has a built-in printer and internal pin pad and can even be used with a car charger. Its rugged design is drop resistant and spill resistant. Its designed for the on the go merchants directly interfacing with customers who must be able to process credit cards anywhere a mobile cell service can be obtained. *** Contact us about purchasing for the Vx680 color credit card processing terminal. Pricing for the Vx670 terminal is a limited time special price subject to change without notice. Contact us for availability.